Three words recurred with amazing frequency through the entire time Teemu Selanne enjoyed the Stanley Cup: 'One more year!' 'Will Teemu retire, having achieved his ultimate hockey goal?' 'Having enjoyed a superb career renaissance, will Teemu try to go for two in a row?' Inquiring minds wanted to know. Teemu met the Stanley Cup in Helsinki, Finland on Friday, August 3, and like the Energizer Bunny, he kept going and going and going.... Selanne was determined to squeeze every second of enjoyment out of his time with the Stanley Cup. Who knows, it may be the only time Teemu gets this opportunity! At 1:45 that afternoon, the Ducks' sniper visited the Helsinki Children's Hospital. To see the astonished looks on the faces of the children was remarkable. Teemu Selanne is idolized in Finland, and some time ago, was named the First Godfather to the Children's Hospital. For the patients to see their hockey hero in the halls, saying hi and showing them the Stanley Cup, was almost more than some could stand. Teemu's smile was genuine and never-ending as he made his way from child to child with the glorious hockey trophy. The world-renowned Jokerit junior team plays out of the Hartwell Arena, and having starred with the team from 1987 to 1992, Selanne decided to drop by and say hello to some friends. As he walked along the hallways lined with team photos, Teemu took the Stanley Cup out onto the ice so that the players could see hockey's grand prize and get each squad's photo with the Cup. Hoping to find the team manager, Selanne went up to the office, but finding it empty, positioned the Stanley Cup on the desk, sat down and put his feet on the paper-strewn desk for a photograph that he'll jokingly (if you'll excuse the pun) send to his friend. Ten thousand people, meanwhile, waited for Selanne in Rautatientori Square, the largest gathering spot in the Finnish capital. Teemu arrived right on time at 5:30, lugging the Stanley Cup, and was greeted by a thunderous roar of welcome. The roar evolved into a chant, barely discernible at first, that soon became a clear chant: 'One more year! One more year!' Teemu admitted that he was still undecided whether he would return to the NHL. "Some days, I feel like coming back for another season," he told the multitude. "Other times, I don't." Clearly, a decision had not yet been made, but it didn't stop the crowd from trying to influence the star's thought process. Selanne kicks back and relaxes in the office of Harry Harkimo, the manager of both the Jokerit junior hockey team and Hartwell Arena. Teemu signed autographs until 9PM, and then left to attend a party held in his honour by the Finnish Ice Hockey Federation at the Teattori Restaurant. 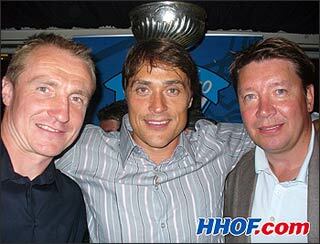 Also in attendance were Finnish NHL stars Jari Kurri, Jere Lehtinen and Janne Niinimaa. A great party, the reception continued until 4:00 in the morning. But that didn't end the night as you might imagine! Instead, Teemu took the party to the harbour where celebrants boarded his boat, 'The Lucky 8,' and continued top celebrate. With champagne flowing and the party getting louder, Selanne and his guests continued the celebration. Then, a wonderful buffet of breads, chicken, sausages, rice, stirfries and cheesecake was laid out for the enjoyment of guests. In Finland, the concept of a sauna is a much-loved part of everyday life, and a Stanley Cup celebration screamed 'SAUNA' to the men at Teemu's party. The orange-shirted fans, doffing their recognized attire, clambered into the sauna, followed by a few others. Teemu briefly brought the Stanley Cup in with him. After beads of sweat began to appear on the upper lips of the men in the sauna, they needed to dive into the ocean to cool off. "May I take the Cup into the ocean if I hold it over my head and keep it out of the water?" Assured that such a celebration would be fine, Selanne stepped into the water, singing a song and hoisting the Cup over his head. Paparazzi flew overhead in helicopters, snapping photos of the Finnish hockey hero. The house party concluded with an elaborate fireworks display. But the celebration still wasn't over for Teemu, who took the Stanley Cup to Helsinki's Lux Nightclub to continue the party. Teemu rode in a limousine on the way there while a party bus filled with friends followed behind. The revellers stayed singing, hooting and toasting until the club closed at 4 in the morning. Time for bed? Nope! Time for a return to 'The Lucky 8'! Teemu and his friends danced and drank from the Cup for a second straight night. Hungry, at 6:00 on that early Sunday morning, they went to get hamburgers. Then, at 9AM, Teemu led the party to the Pata Assa karaoke bar. Oh my! At first, the club was comprised solely of Selanne and his pals taking turns singing, but soon, the word spread around Helsinki and the karaoke bar filled with partiers. Teemu chose to sing traditional Finnish folk songs while some of his friends selected rock classics. The paparazzi snapped shots of Teemu as he exited the club at 11:30 on the morning of August 5. "Any shot with Teemu and the Stanley Cup brings cash," explained one of the photographers. After quickly freshening up, Selanne went over to the arena and met the HC Salamat hockey club, a team from Kirkkonummi owned, in part, by Teemu. Canadian fans will recognize that team as the one on which women's star Hayley Wickenheiser played in 2003 when she became one of the first women to play professional hockey on a men's team. Teemu took the Stanley Cup out onto the ice, allowing the players to get a close look and photograph with the hockey chalice. "What a trip! I'm going to bed," proclaimed Teemu. After 48 hours of constant partying without so much as a nap, the Anaheim star deserved the rest. As the party raged over two full days, friends and family dropped out and slipped back into the party, but when all was said and done, Teemu Selanne was the last man standing. And through it all, prodded by fans and friends, not once did he tip his hat as to whether he'd once again grace the NHL icelanes in 2007-08. The Stanley Cup travels next to Togliatti, Russia to celebrate with Ilya Bryzgalov, and you can find out what went down when you join us again on Friday, as we turn another page of the Stanley Cup Journal.